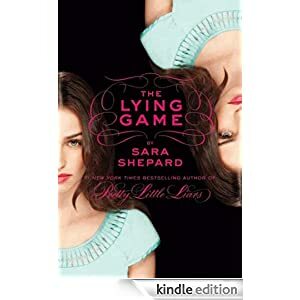 About a month ago, one of our delightful hosts (Heather) posted a review about the Sara Shepard series: The Lying Game. Since I was a mega-fan of the Pretty Little Liars series, and because Heather read them all in less time than it would take an average person to paint a dining room, I downloaded the first one right away. And you know what? The Lying Game, Book 1, is just as freaking fabulous as I expected it to be. In other words: Sarah Shepard is the bomb. It’s simply amazing to me how Ms. Shepard manages to create the MOST unlikable characters, while still giving them just enough humanity that I find myself unknowingly rooting for them. Seriously, guys, I had no idea how she’s able to do it so well—it’s like ninja-style character development at its finest. I will say, though, that the MC, Emma, is the exception to that rule because she’s pretty darn awesome. She’s kind, thoughtful, strong, and knows who she is, which is a good thing because she spends the entire book posing as her didn’t-know-she-even-existed twin sister, Sutton (who was apparently quite the bey-otch), so she can figure out who murdered her. And, just like PPL, all of this takes place in high school. Well not "in" high school, per say, but all of the characters are students. I will caution you that the writing can be confusing, at times, because the POV changes with no warning (from Emma to Sutton--or, more specifically, Emma and Sutton's ghost), but I didn’t mind that it stopped me in my tracks because I was so interested in what would happen next. Again, this is a serious accomplishment, although I do wish that the transitions had been smoother because it would have been awesome to just be able to get lost in the story. The plot arc seems like it will hold more weight than in PPL because of Sutton's ghost's POV, though, so I'm hoping for tons of cool twists. The whole plot composition seems slightly more sophisticated as well and I can't WAIT to see where the mystery will take me. I had another beef with the book but I can’t talk about it without being spoiler-y, and I’m hoping that it’s something that will be remedied in further books, which I will FOR SURE be reading because Book 1 was a non-stop ride on the you’re-kidding-me train and I want to go all the way to the station. Woot woot, people! Haha!! So, thanks to Heather for introducing me to a wicked new series! Haha...I guess I did read it super fast!! I'm dying of curiousity-- what was your beef?